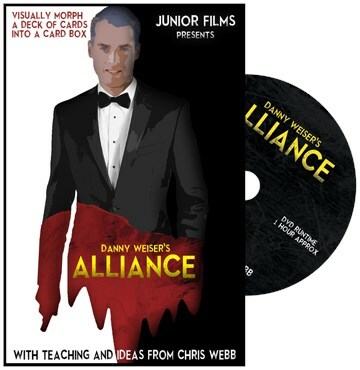 To bring you just a little more value we like to look at every angle of a trick before deciding to bring it in, and we really like the variation in effects possible with Alliance by Danny Weiser. You can change up from day to day what effect you get out of it, which can give you the image of real powers over a box of cards. Be it friends asking you to "repeat that trick where..." or repeat clients at a restaurant or strolling gig, being able to mix up the effect is very strong magic. Taught in full detail including extra routines and handlings including a super visual reboxed effect and a colour changing deck. This so incredibly visual that I can't wait to get it. What an amazing trick it is to so instantly, so visually cause the deck to jump in and out of the box. I was waiting to get this but I'm not waiting any longer. It's so strong of an image that I know I'm going to be using this a lot! It doesn't add much to my pockets which I really love. Easy, visual, workable. Enough said! Great work!